Towels may seem unglamorous, but when they’re needed it’s important to have them on hand. Not only that, but they need to be cleaned and well-kept in order to let your clients know that your facility cares about their health and comfort. 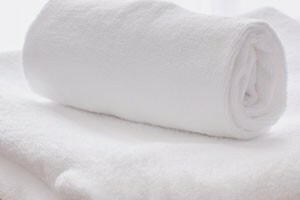 From barbershops to spas to fitness centers, terry cloth towels are important for a variety of industries. In today’s blog, we’ll talk about some of the types of facilities that can’t afford to do without terry cloth towels. Learn more, below. Terrycloth towels are useful for a wide range of applications! Terry cloth towels serve a lot of different purposes in gyms. While they are important for drying off after a shower, they’re useful for far more than that. You’ll need to keep them on hand to wipe down equipment and mats as well as furniture throughout your facility. By using terry cloth towels instead of disposable paper towels, you’ll save money and cut down on the amount of waste that your facility creates. And by renting your terry cloth towels from Lord Baltimore Uniform, you’ll never have to worry about washing or replacing your towels. After a customer’s hair has been washed, it will need to be towel-dried before the haircut can begin. Terry cloth is soft and absorbent, making it perfect for this purpose. Towels can also be used as a head or neck rest on a spa massage table or a hair washing station. They can also be used to clean your facility after hours, so you can never have too many on hand. When it comes to cleaning a medical facility, nothing can beat the anti-bacterial qualities of microfiber. However, for other applications terry cloth towels are an effective and affordable solution. From cleaning up quick spills to wiping up cafeteria tables after hours, terry cloth towels can help keep your hospital or medical facility in tip-top shape. For over forty years, Lord Baltimore has provided reliable, cost-effective uniform rental solutions as well as terry cloth towels to clients of all sizes throughout Maryland, Washington DC, Northern Virginia, Southern Pennsylvania, and Delaware. This entry was posted on Friday, May 27th, 2016	at 9:37 am	. You can follow any responses to this entry through the RSS 2.0	feed. Both comments and pings are currently closed.